by Rhiannon Reintjens, Junior Editor for Non-fiction jaBlog! 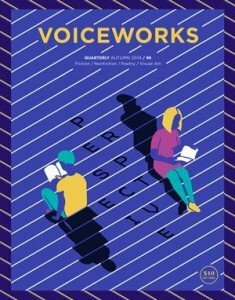 Voiceworks is a national Australian magazine published quarterly by Express Media, an organization that supports young people in writing and media. They publish work by Australian writers aged 25 and under. It’s printed four times a year, so there is plenty of time for each writer to polish their work before submitting. Voiceworks accepts short stories, poems, non-fiction, and artwork. You can submit up to four pieces in total, across any of the genres. However, each genre has its own submission guidelines regarding the number of pieces you can send. Fiction: No more than two pieces with a maximum of 3,000 words each. Poetry: No more than three pieces with a maximum of 100 lines each. Non-fiction: No more than two pieces with a maximum of 3,000 words each. Visual Art: No more than three pieces. Keep in mind that Voiceworks only considers unpublished pieces. Anything! What you write about is up to you; however, racism, sexism, and homophobia are not tolerated by the Voiceworks team. If your submission is accepted, not only do you get a publishing credential, but you get paid for it, too. Voiceworks pays $100 per piece they use. You also get the benefit of going through a collaborative editing process. This can benefit you later as you gain skills and experience in working with an editor. If you’re not successful, don’t be too disappointed. Feedback is provided on each unsuccessful submission. This feedback tells you what worked, what didn’t, and any areas that might need improvement. Either way, you benefit from sending in your work. What do I need to do before submitting? Before you submit anything to Voiceworks, they recommend that you buy a copy of the magazine and see what sort of work they publish. That way, you can determine whether or not your piece is right for them. Also, make sure you follow the submission guidelines very carefully. Voiceworks is like any other magazine. If you don’t follow the rules, you don’t get published. For more information or to submit to Voiceworks, please click here. For more information on Express Media, click here. Rhiannon Reintjens is a 20 year old writer from Australia. She has loads of ideas but isn’t very good at putting them on paper (or computer screen). She hopes that one day she will actually finish writing a novel.